I have never liked marrow. But then again, before I went vegan I also didn’t like courgette, aubergine, cauliflower or mushy peas! So when we saw one in the shops the other day, my husband suggested that I give it another try. 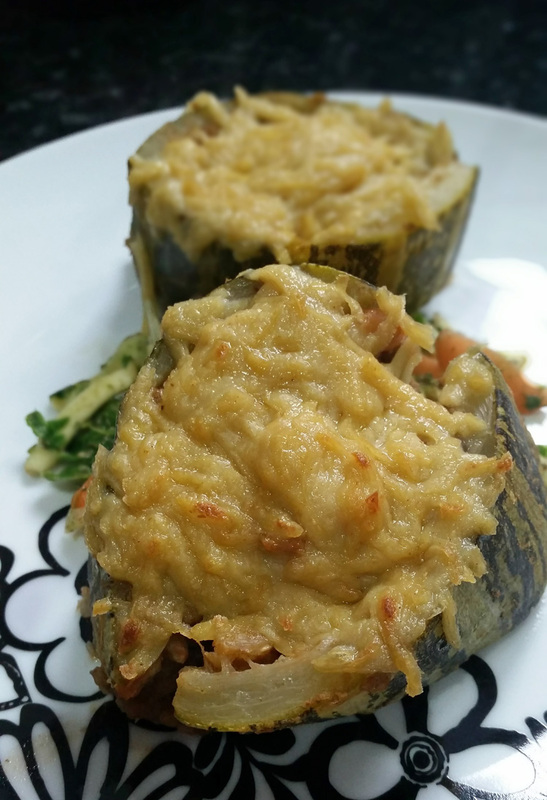 The last time I had eaten marrow, my mum had stuffed it with sausage meat – bleurgh! However for mine, I had recently come across this recipe for lentil and brown rice chili and I really wanted to give it a go, so I decided to make them “Mexican” style. I’ve also discovered a fantastic recipe for a smoked coconut gouda. This “cheese” is made from a can of coconut milk – not that you can tell! It’s refreshingly easy to make, meltable, grateable and super tasty. 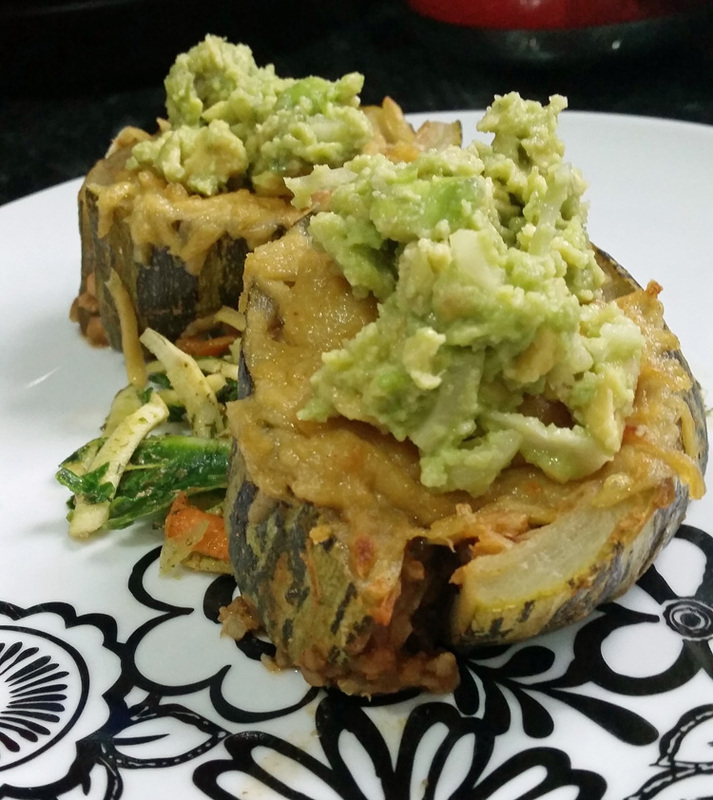 So of course I had to top my Mexican marrows with a handful. 1 x medium sized marrow. 1.5 x cups of grated smoked coconut gouda. Optional: 1 x cup guacamole. Fill a large pan with water and bring to the boil. Turn off the heat and add the marrow halves. Cover and leave for at least 10mins or until ready to use. 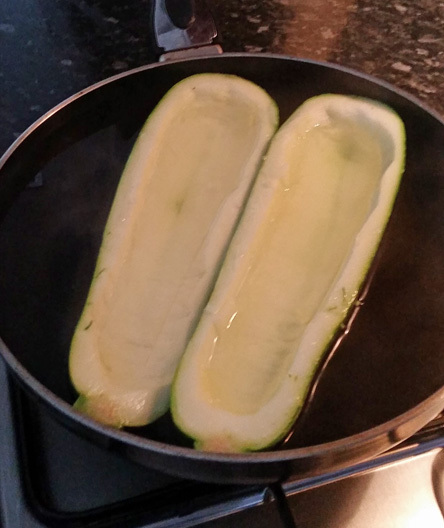 Remove the marrow from the pan and dab dry with some kitchen roll. Add the chili to the hollowed out area and use the back of a spoon to level off. 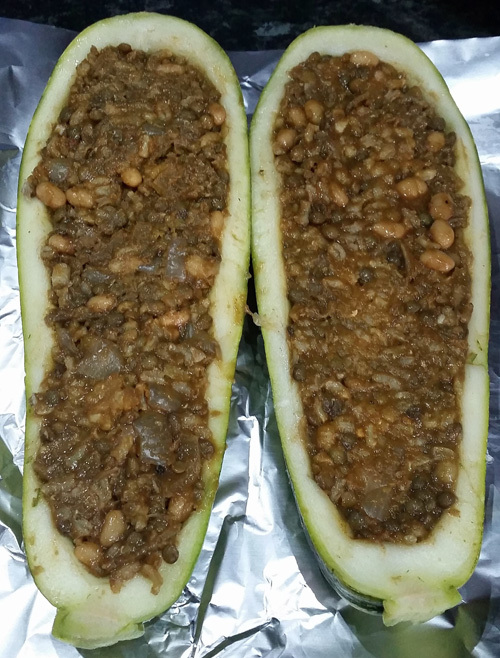 Caaaaareeeefully, put the two halves of the marrow together again and wrap tightly in foil. Put onto a baking tray and bake in the oven for 40minutes. Take the marrow out of the oven and leave to cool for 15 minutes or until cool enough to handle. Unwrap and slice off the ends. Cut the rest into into 6 equal rings. Transfer the rings onto a baking tray and top with the grated cheese. Pop under the grill for 5 – 10 minutes or until the cheese is melty and browning. Remove from the grill and if using, top with guacamole. I served mine on a bed of grated veggies in an apple cider vinaigrette.